Art in Public Places for the HJULC Building Made Their Final Selection! 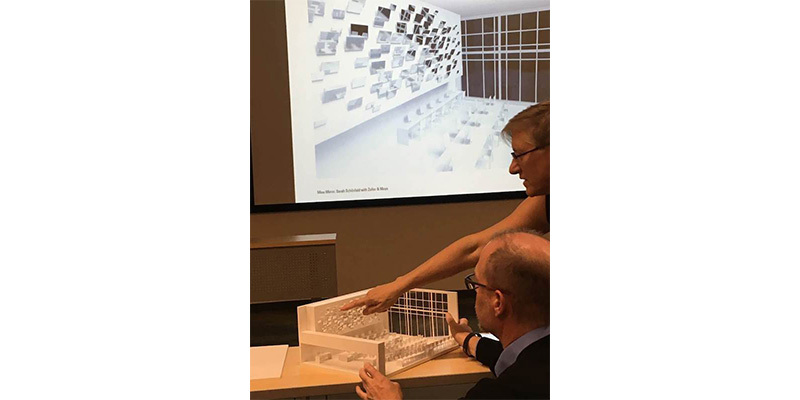 “Our proposal for an artwork on the large wall in the Computer Lab of the Hardman and Jacob’s Undergraduate Learning Center (HJULC) is a site-specific intervention, which involves and addresses three main elements: the students, the (digitalized) knowledge of the University, and its corollary architectural environment. Our work will engage with these three elements and rearrange them into a spatial arrangement of multiplied perspectives. The formal commissioning of the project is currently in process. We will keep you posted when the installation of Mine Mirror is installed. *Event Image: Julia Barello discussing Sarah Schonfeld’s maquette of Mine Mirror with Dan Kemme. This entry was posted in Awards, Competition, NMSU Department of Art, Uncategorized and tagged #aipp, #HJULC, #nmsuart, #nmsuartdept, #onepercentforthearts, #sarahschonfeld. Bookmark the permalink. Follow any comments here with the RSS feed for this post. Both comments and trackbacks are currently closed.